The Cavision 4 x 5.65" Day for Night Filter is a great way to create images simulating dusk or night-time while filming during the day. 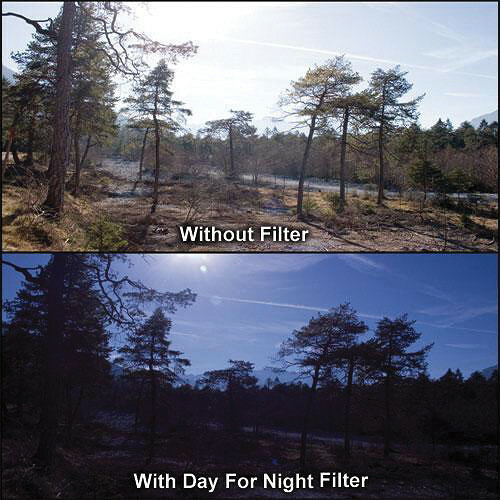 This filter is valuable since is enables you to shoot during the day instead of paying overtime to a film crew for night work. This is a huge benefit when working a strict budget or when production time is of critical importance. This unique filter is tinted lavender blue which is, normally, associated with the color of moonlight photography. Cavision is a Canadian company specializing in quality filters for film, broadcast and video productions. They also produce a variety of equipment including 3 x 3" and 4 x 4" matte boxes, boom poles and wide angle attachments for TV cameras. Box Dimensions (LxWxH) 6.7 x 5.1 x 0.7"